In our last post we affirmed our desire to support the highly skilled women who continue their tradition of creating silk and cotton yarn, natural dyeing and hand weaving despite the challenges posed by globalized modernization and the current economic downturn. A case in point was our recent visit to the Prae Pan Group in Khon Kaen, Thailand, which we first visited 4 years ago. 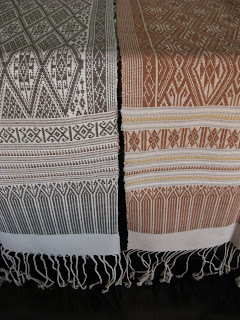 They still produce beautiful weaving, still have an impressive inventory of finished pieces and still have an active storefront in Khon Kaen, which is Thailand's 4th largest city. However, despite 2 decades of success, this group is finding it increasingly difficult to stay afloat. Khon Kaen, by the way, is one of our favorite Thai cities. There's a large park with a small lake in town that Ellen is happy to walk around every morning and a large number of tasty noodle shops and khaow mun gai stalls where we can have cheap and tasty meals. It appears that very few tourists visit Khon Kaen, which may help explain why most people there are extremely welcoming to us. However, this also means that there are very few tourists, foreign or Thai, visiting the Prae Pan shop. It's not surprising that sales are down. The bulk of the people in Khon Kaen province are rice farmers who live outside the provincial capital. More and more often, their young people are moving to urban areas where they can experience urban life and modern trends. At the same time, many factories are opening in the rural provinces where there's a surplus of labourers accustomed to hard work and low wages. All of these reasons add up to a growing pessimism whether rural women's groups like Prae Pan are actually sustainable and whether younger women will have learned the necessary skills to continue the tradition before their mothers and grandmothers are no longer available to teach them. Consequently, we've decided this year to focus our selection of Prae Pan's work on a traditional style of khit weaving (using supplementary wefts), which the group's board members tell us may not be available in the coming years. We've selected ancestral patterns with design qualities that transcend their original meanings so to be appreciated by those outside the culture which produced them. We've also chosen sizes and colours that are well-suited to decorate tables, chests and dressers. We hope you'll agree.